Universal tablet holder is on swivel base to easily rotate phone or tablet 360°! 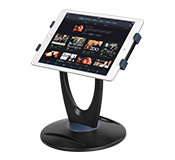 A universal tablet holder, like countertop iPad stands, can be used in a variety of locations to allow employees or customers alike have easy access to a tablet. The stand has a rotating base that features full 360° movement, making it easy for an employee to spin the device for customer use and then bring it back to finish a transaction if in a retail store or restaurant. The stand can display most Samsung, Lenovo, Apple and other tablets comfortably. This universal tablet holder is great for holding a variety of sizes of models in addition to makes, with 7.9" to 13" models fitting in the stand. The rotating head of the iPad stand makes it easy to switch between landscape and portrait without removing the device. You can also change the viewing angle to best suit your purpose. The bracket back has a rubber pad to help prevent the device from sliding, with each side utilising a sliding arm to secure the screen in place. 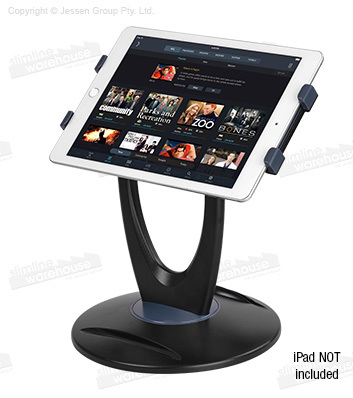 This iPad stand is made from black plastic with some grey accents, offering a stylish look that will fit in with a wide variety of decors without any issue. 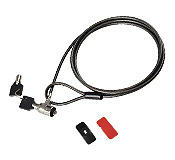 Using black plastic ensures a durable display that also works within the budget of any location. Slimline Warehouse provides same day despatch with almost all in stock products purchased by 2pm EST to anywhere in Australia! Although this product fits most 7.9"-13" tablets, please make sure that your tablet's minimum width falls between the holder's grip range of 196 - 245mm. Please check your tablet compatibility here.